For the first time since its creation, Edo state government has approved 50 percent waivers for tax defaulters in the state. The moratorium which has its terms and conditions, among others, require that all the outstanding tax liabilities running into billions of naira inherited from by past governments up to December 1, 2016, must be paid within 90 days to be eligible for the offer. A statement endorsed by the Chief Press Secretary, Mr. John Mayaki said Edo Governor Godwin Obaseki’s gesture was meant to tidy up tax system and encourage them to join the pool of 10 percent who pay taxes in the state. 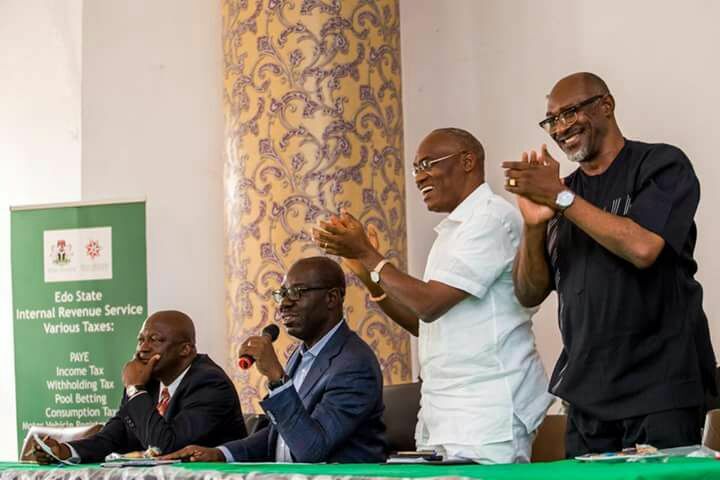 Obaseki disclosed this during a meeting with the Management of Edo state Inland Revenue service (EIRS) and representatives of tax payers in the state which held at the Weekend in Benin. His declaration was in response to some issues of concern raised by some tax payers in the state bothering on wrong profiling and arbitral tax assessment, which they claimed have set them on edge in the face of the economic recession. He said the waiver for tax defaulters with a positive impact on outstanding and the penalties which have accumulated over the years. The governor promised that the tax administration of EIRS will be reviewed to check the perceived abuses and arbitrariness in tax assessment and in the state. He said there would be adequate deployment of Information Communication technology (ICT) and trained personnel across the various offices of EIRS in the state. Obaseki hinted that an online portal where tax payers could assess and file their tax returns effortlessly would be set up in the next six months. “On a final note, I agree with you, this is a new era. We are in a recession. Things are difficult and as a government that is listening, we must respond, but also, as a people, you must also reciprocate. “Therefore, we will look at all outstanding tax liabilities. We will wave most of the interest and penalties that have accumulated and impact on what is outstanding. “Depending on the category, it is from the waiver that you will get up to 50 percent of what you owe provided that you also agree that you make the payment of what is outstanding within 90 days. We hope that you will also reciprocate by making sure that you clear all your tax arrears so that we do not take them into the new year (2017). “We want a new start of a new dawn. We want to clean up and ensure that we face the future together with a common sense of purpose. “We will be investing more in Information Communication technology (ICT). With ICT, you can assess yourself and file your returns on your own. “We will be upgrading our different area offices across the City and the state to make sure that they serve you better. “We will be training a lot of new employees who will treat you properly. “You are Edo Citizens and you are not people under captivity, therefore our role as government is to serve you. We are collecting these taxes to provide service to you. We will not allow a situation whereby you see us as evil and unfriendly. Government must be friendly and perceived as humane. However, that is not a sign of weakness and that is something that we must emphasize in EIRS”, he said. The Executive Chairman of Edo state Inland Revenue, Chief Oseni Elamah earlier in a remark, said the state government has temporarily suspended the enforcement of a Ganeshi order against defaulters of the land use charge and consumer taxes to allow for dialogue. He said some Federal government agencies and hospitality business operating in the state have developed the habit of not remitting the personal income taxes otherwise called PAYE tax of their staff and employees.